This week's Diva's Challenge is working with negative space. I have seen lots of interpretations of this in the works submitted by other artists that you can find here. I love using words in my art so it may not surprise you that I'm using words here.. The following piece was done about a year ago for a group on Facebook that I belong to called Doodle Tuesday. 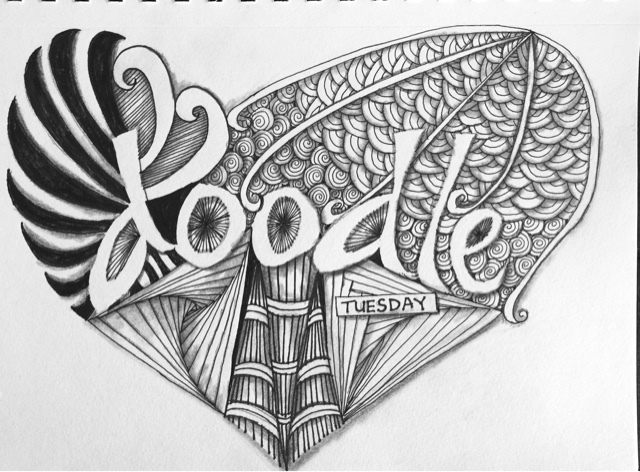 I love how the word doodle pops in this. 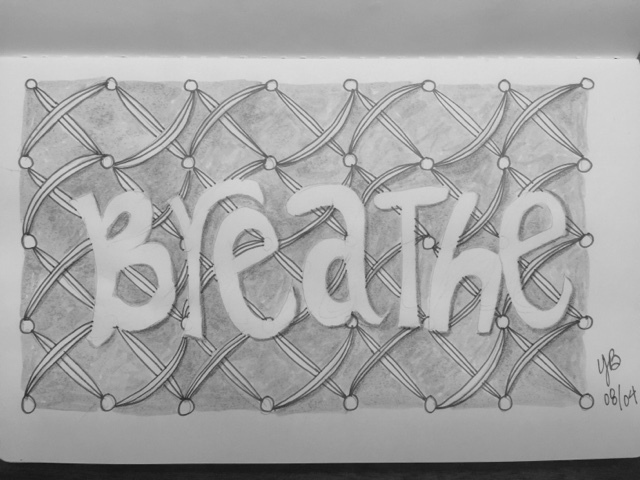 So for my challenge piece, I went with the word, 'breathe' and a single pattern, Harfe. I used an ink wash to shade and used a colored pencil to add a bit of shadow. I think the fact that my son got his driver's license yesterday, my middle child is starting high school, and my youngest starting middle school...and a few other life issues are telling me to breathe, calm down, and if you can't , throw a fit!! It really has been a tough year for my family this year, but art has kept me sane, kept me grounded. What keeps you calm and grounded? You've made the whole piece peaceful and enjoyable with the word breathe. It has its own calming quality. Sarah. Thank you Sarah! This has been my mantra lately! I love the doodle one, Angelcake. When I look at it I hear calliopes :) . 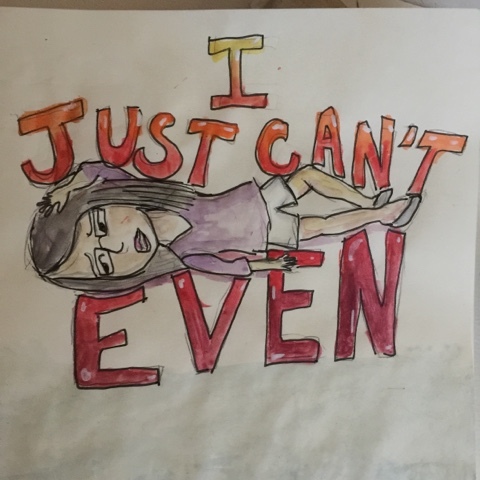 I must admit though, on laundry day, I feel the "I can't even" ! I'm a generally calm person. A panic attack on occasion revs me up a little. I hope you had a great trip! Happy laundry!! Je trouve intéressante cette idée de tangler autour de mots. J'aime beaucoup ! I find interesting this idea to tangle around words. I like very much! 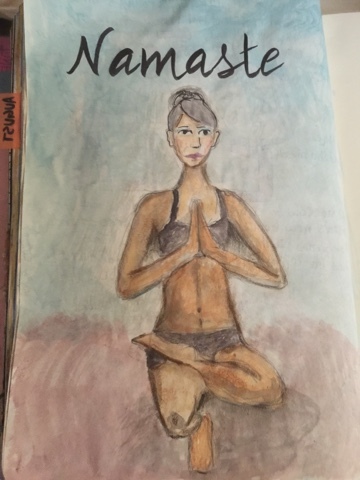 I love your thoughts on the negative space theme, and love your artwork expressing daily stress and suggesting yoga as a way to deal with that. I love in yoga how they describe the pause - like a negative space - at the bottom of each exhalation. That can represent a kind of break from all the "going on" parts of our lives, and while empty, can add to our well being. Love your works and your thoughts this week! A lot of beautiful art! I love the tile for this week's challenge. I think tangling calms me most, but also being in nature or music. All are very lovely! Especially I like the first one ... it´s wonderful and very harmonious!